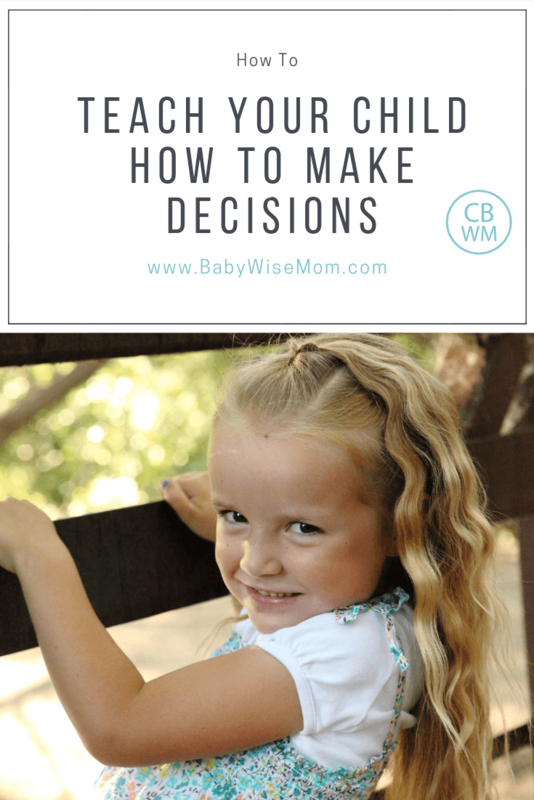 How to Teach a Child How to Make Decisions. How to set your child up for success to make informed decisions and accept the consequences of those decisions. This is a continuation of How To Give Your Toddler Boundaries. Boundaries give us freedom. When we know the choices, the limits, and the consequences, we are able to make a full decision. We are aware of what will happen when we cross the line and what will happen when we stay far from the line. We are free to live our life in the way we really want to. Our children will grow up some day. They are growing up each day. The time to teach them about boundaries is now, not later. You train them now while the stakes are low. Most choices they make at the age of toddlerhood are not going to make or break something of huge significance (at least from an adult perspective). We aren’t talking about grades that will affect which college to get in to or committing some crime that gives them a record or worse. This isn’t to say that the things you teach them at this young age are of little importance or that your toddler can’t possibly make a choice that can be detrimental to him. It is to say that giving your child boundaries now will teach him about choices and consequences, so when he has those more important choices in the future he is better equipped to handle them. He will know that consequences are real and will have respect for them. On Becoming Toddlerwise states that boundaries take on two forms. Physical boundaries and neurological boundaries. Physical boundaries are important for your toddler. Your toddler lacks the knowledge and life experience to know what can be dangerous and what cannot. These are boundaries for health and safety. Neurological boundaries are associated with learning. Your toddler is an individual; “…your toddler’s developing brain sets its own boundaries and has its own way of organizing” (Toddlerwise, p.30). A good way to teach your child about consequences and choices is to put in place your physical boundaries. You have certain things he can’t touch and certain places he can’t go. You have certain times he needs to wash his hands. You also have your neurological boundaries. There are activities your child doesn’t do yet because he isn’t mentally ready for them. He needs to learn smaller steps to lead up to the activity. You limit his time in front of the television to allow for active rather than passive learning. You guide his curiosity to help him learn rather than letting him wander at will in order to learn. You provide structure, guidance, and proactive teaching. You keep freedoms equal to your toddler’s self-control. I would like to revisit my illustration on boundaries from the last post. Remember the three papers? Let’s discuss how this might be applied to your child in real life. SITUATION ONE: I put before you three pieces of paper, each with a different picture on it. I then tell you to pick one, so you do. I then deliver a consequence for your choice. I think as parents we do this to our children more than we realize. The problem with this situation is that we are delivering consequences to our children without first explaining the rules. In this illustration, they don’t even really know what they are picking. Perhaps you tell your child to choose a shirt for the day. The activities of the day require a dressy shirt, but your child doesn’t know that. He chooses a shirt with Lightening McQueen on it. You are a little stressed because today is a busy day. You become frustrated with his choice and reprimand him. Maybe you remain calm and don’t reprimand him, but tell him he can’t wear his fun red shirt, he has to wear his white polo shirt and he gets upset. You then punish him for getting upset at your instruction. In reality, this wasn’t fair. He started off thinking he was choosing his shirt for the day. He chooses and feels proud of himself for being so responsible and he feels excited to wear this awesome shirt. You then reprimanded or told him now and chose for him and he naturally becomes disappointed, which earns him more negative consequences. Here is another possible scenario with this situation. You might tell your child he can finish his show if he wants to before bed. Once the show is over and bedtime arrives, you tell him there is no time for a story tonight because he chose to watch a show instead. He is disappointed because he loves to read stories with you before bed. The problem here is that you didn’t tell him if he watched his show he wouldn’t get to have a story before bed. Sometimes you might find that you have taken this scenario a bit further. When Brayden was young, our family went to visit a couple who had just adopted their first baby. I guess I assumed my three and a half year old son would know how to act and what would be expected of him. The couple we were going to visit are good friends of ours. They love children, and having previously had none of their own, they were surrogate children to all they knew. My children loved them. My son was very excited to be there and expected the same level of attention he had always enjoyed. He basically got hyper in the excitement. I was disappointed in this. He was a visitor and there was a new baby in the home. I realized I had expected him to see the choices he had before him and to also choose the correct choice without me even telling him those choices were there. A few days later, we took dinner to this same family. Before we left our home, I sat down with my son and told him the appropriate behavior for the occasion. I told him there was a new baby in this home and we needed to show the baby respect. We needed to speak quietly and we were not to run around. I also brought a few toys for my children to play with to keep them occupied—you know how people don’t have toys for kids before they have kids. This visit went very well. In fact, it took my son about 15 minutes before he even talked because he didn’t want to disrupt the baby. He knew about the choices he had. He also knew the consequences of each choice. I didn’t have to threaten him with any direct consequences to himself; I simply had to explain to him how we show respect in a situation like this. SITUATION TWO: I put before you three pieces of paper each with the same picture on it. This situation can actually work well in the young years while you are teaching your child how to make choices and live with those choices. Something simple to do to teach your child consequences of actions and choices is to give him choices. Of course you want to keep in mind the funnel and not give choices that are beyond his ability to handle them. At first these choices are of little consequence in the grand scheme of life in your eyes. Let’s return again to the example of choosing which shirt to wear. You could choose two shirts you would be happy with, then you let your child decide which shirt he wants to wear. He then has the consequence of that choice all day. You don’t put him in one then change it an hour later when he has changed his mind. He chooses his shirt and then wears it for the day. As he gets older, you increase his freedoms as he demonstrates ability to handle it. Perhaps you will increase his options to three shirts. Some day, he will be able to choose any shirt he wants to. Eventually he will dress himself. I have watched my son through this process. As a three year old, some days I chose everything he wore–I did this for things like family pictures and special occasions. Other days, I chose either the pants or the shirt. Others, I let him chose it all. On those days, he always asked me if what he had chosen matched. He had grown bit by bit and learned along the way. Teach bit by bit so as they get older, they can be more independent and understand how to make the decision. This situation becomes a problem when you don’t expand the freedoms as your child grows into them. As we read in the –wise books, not expanding freedoms creates frustration in the child. In summary, this situation of giving your child 2-3 of the same choice can be useful in the young toddler years, but can become a frustration to your child if you do not expand freedoms as appropriate. You want to expand his freedoms so he can practice making real choices as he is able to handle them. SITUATION THREE: I place the three different pictures in front of you, but this time, I explain that each picture has a different consequence. One is positive, one is negative, and one is neutral, but I don’t tell you which picture is which type of consequence. For this, perhaps a parent will say “Yes, you can have a treat from the refrigerator, food cabinet, or dish of fruit on the table.” The child selects a Popsicle from the refrigerator and the parent punishes the child for that decision. Perhaps the parent tells the child the Popsicle is unacceptable so he will have no treat at all. The parent wanted the child to choose a piece of fruit since it would offer the most nutritional value. The child had no knowledge of what consequences each option would bring him. That may seem extreme, but we parents do this more often than we might realize. Maybe you give your child a choice in what game to play, and then get noticeably disappointed with their choice. Maybe you tell your child to choose a book to read at night, then turn down each choice for various reasons. Those situations get confusing for little children. If you have stipulations tied to a choice you are offering to your child, make those stipulations clear. SITUATION FOUR: I put before you the three different pictures and tell you the first one will earn for you a piece of candy. The second one will cause you to lose a piece of candy. The third will do nothing. This situation offers the child the options for a choice, then tells him what will happen with each choice he makes. This is the most ideal situation for you and your child. This helps your child learn to make a choice and learn to deal with the consequences of that choice. It gives him the option to choose while having full knowledge of what the consequence, good or bad, is of each choice. This is the situation that fully teaches him about his ability to make choices. It teaches him that consequences are a reality in life. When you allow your child to make a choice, be sure you make it clear what the consequences will be of various options. Boundaries are important. I know that many parents today cringe at the thought of putting limits on their child. They worry about stifling creativity and learning ability. They look to the future and all the rules that will have to be followed and don’t want to start that earlier than they have to. 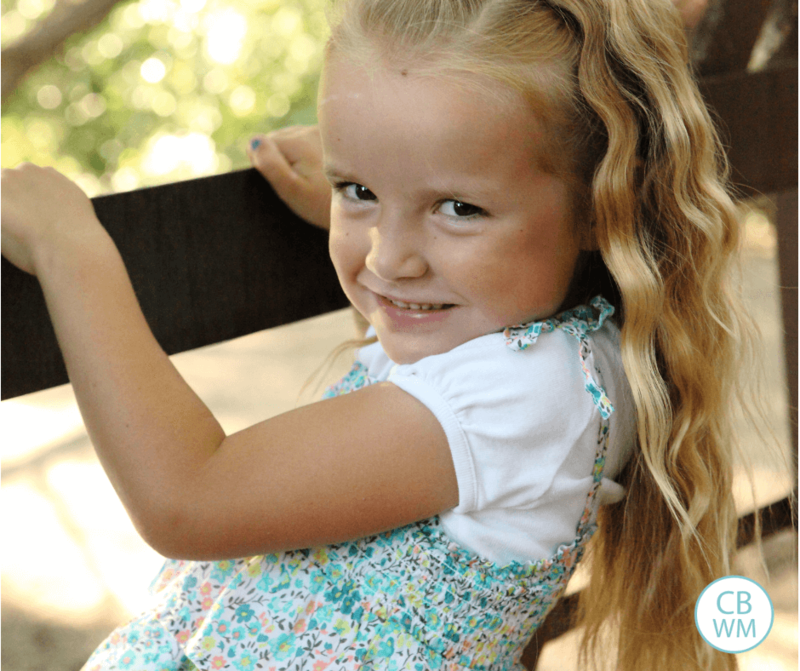 “Let kids be kids.” But not giving boundaries is a great disservice to your child. Without physical boundaries, your child can get hurt. Without neurological boundaries, he won’t grow in intellect as quickly as he could otherwise. Without boundaries he will not grow as a person. He will not learn about consequences. He will have expectations of the world that the world simply isn’t willing to give back; only his parents are willing to bend over backwards for him. Help your child to learn and grow as much as possible by placing the necessary boundaries on him now. My DD just turned 1 and is very active physically. She walks/runs and is quite independent. I had been letting her play on her own thinking that was helping her learn how to entertain herself instead of needing someone to entertain her. However, I realized after reading your post I was “letting her wander at will in order to learn instead of guiding her curiosity to help her learn.”How do I guide a 1 year old during the day? Thank you! Now that my DD is getting older, I love these toddlerwise posts! This is not related to your post today. My 9 1/2 month old has been sleeping through the night since 4 weeks old. We have been using BW since we brought her home. I nursed exclusively till she was 6 mo and now she is on solids also. She gets up at 8a eats, plays then like clock work at 10 is ready for her nap. Her schedule is normaly wake 8 nap 10 wake Noon nap 2 wake 4 nap 6 wake 8 down for the night about 9:30. I have 2 questions. Recently she has been consistantly waking 1/2 an hour early, even in the morning. She is happy and will play for 15 min and then gets mad and wants up. Do I let her play then get her up, wait till she gets mad, get her up right away and feed? I can not get her to strech her awake time. Also, she still has her evening nap. Most of the time she will sleep the full 2 hrs from 6 till 8. Do I need to try to wean her off of this nap? Thank you for your help. I appreciate your blog. My question is similar to Emily’s. My daughter is 15 months and I’ve always struggled with the balance between how much time to let her play on her own, and how much time to structure, guide and proactively teach, as you put it. I’m also not sure about how and what to teach right now. I have had no experience with small children until now with my own, and I’m feeling a bit lost. Please help!! Thanks! I just want to say thank you so much for your postings and ministry in this area. My husband and I have a 4 year old and 3 month old and have Babywise/GKGW followers from the beginning. It is so nice to read about the experiences of others and to find encouragement here, especially on the tough days. I am curious to see your response to Jaclyn. I feel the same way alot of times and have the same age lo. We seem to be getting on some what of a better routine throughout our day but I still feel like there may be to much free play and honestly I don’t think she really enjoys it that much. Maybe you have suggestions for table activities…my lo isnt coloring yet. Thank you for your input once again! This blog has really been a blessing!! Emily,If you make sure you have your recommended play activities, it should all work out well. For example, indepenedent play, free play time, structured playtime (there are posts on all of these topics). Don’t let her play with anything she wants to just because it is interesting. A one year old might not be able to cause much damage, but a 2-3 year old can. Don’t let her play with things that she doesn’t know how to use appropriately (an example used in the -wise books is the remote control). tamarakmc,I would start to wean her from the last nap. At first, just shorten it. Either put her down later, wake her up early, or do a combo of both. You can take it as slowly as she needs. Be sure to see the dropping naps posts for more on this process.What you do when she wakes early is up to you. If you don’t mind things starting earlier in the morning consistently, then I might just get her up. If you really want the 8 AM waketime, then let her play for a bit before getting her. BUT if you wait to get her, I would try to get her before she gets mad or she might start to become impatient immedieately and overall when she wakes up. Jaclyn, My advice is similar to that for Emily. First, have your independent play, free play, and structured play. You don’t need to worry about structured teaching times at that age, but you can always be on the lookout for things to teach her. She is always learning, so it should be easy. Sing the ABCs. Reading books is great. Go for walks and tell her about the things she is seeing. Have her play with toys that teach things (my next toys for baby post will be in the age range of your daughter). Look for the “More than making it through the day” post coming soon, also. Thanks Angie! I appreciate your thanks and am glad this blog can be of use to you. IzzysMama,I would say the same things to you as Jaclyn. Thanks for the thanks! More to come. This is somewhat unrelated, but thought you might know… I am interested in taking the classes on Growing Kids Gods Way but have no idea how to find a place in my area (southeastern WI) where someone is offering the classes. Can you tell me who or what website could help me find this info? Thanks! Nikki, check out growingkids.org to find information on it. I know not all areas in the country offer classes, but if there is one in your area, that is the site to find it on. I began reading Toddlerwise this week and recently found your blog post. I'm in the middle of creating a schedule for my toddler, but I'm a little confused about the difference between roomtime and free time. I was hoping you could clear it up for me! Becky, see the blog labels on each. Roomtime is "independent playtime"Basically, roomtime would be in a room (I do my kid's own rooms, but it can be any room). You pretty much choose the toys played with, but I don't worry about them choosing others. Free time is a time the child chooses what to do.